The mechanical frames can assist in walking, lifting, fighting Xenomorphs, etc. We might not be looking to get behind the wheel of an Elantra or a Tuscon right this moment, but we'd drop everything to test drive Hyundai's newest project - a robotic exoskeleton that looks ripped straight out of a comic book. 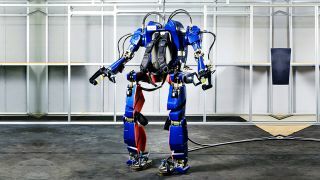 Hyundai Motor Group even went out of its way to reference Iron Man in announcing the exosuit, showing pictures of The Iron Avenger on its website next to shots of the "wearable robot" lifting up heavy objects with mechanical ease. The frame is designed primarily for work use, moving heavy or hazardous materials while minimizing injuries, especially in the worker's hip and knees. Hyundai also suggested military uses for the armor - allowing soldiers to march with approximately 50kg in bulky gear without feeling strain. Hyundai is also developing a more lightweight exoskeleton that latches to the back and legs of a host to augment their walking. This design is intended primarily for the paralyzed or elderly to assist in everyday life, but Hyundai adds that the frame would also help with rehabilitation of the injured. While exosuits aren't new - especially in the world of military research - Hyundai's models seem to emphasize transportation over warfare, which makes sense if you're Tony Stark after he gets his first Arc Reactor. Or, you know, a car company.